A new “vintage” signal processor. It's rare to find a truly outstanding solid-state channel strip that can deliver a vintage vibe reminiscent of classic high-end products, yet employs a thoroughly modern design. To find one that you can buy without heavily depleting your bank account is even more rare. But there is one channel strip that delivers the goods without the big tab: the PreSonus® RC 500. The RC 500 combines a custom-designed FET compressor and semi-parametric EQ with a distinctive, ultra-low-distortion, high-gain, solid-state Class A preamplifier design. The result is a top-of-the-line — yet very affordable — channel strip for recording engineers and recording musicians with a sound that is reminiscent of classic, vintage solid-state preamps. The solid-state preamp that instantly became a legend. When Robert Creel, the engineering mastermind behind the XMAX preamp and many of our other best analog circuits, demonstrated his newest solid-state preamp design, we knew it was going to be special. Creel’s new preamp uses a Class A hybrid input stage with discrete transistors and the latest-generation, low-distortion operational amplifiers, and when we heard its transparent, detailed, clear sound, it instantly became an in-house legend. By popular demand, Creel’s superb preamp became the heart of the new RC 500, named "RC" in his honor. Read more about the preamp design. The RC 500 solid-state microphone preamp features a Class A hybrid input stage with discrete transistors and the latest-generation, low-distortion operational amplifiers. The design maintains the sonic qualities of Class A and benefits from the repeatability in performance of the operational amplifier. Power amplifiers are classified primarily by the design of the output stage and are designated Class A, B, AB, D, G, or H. In a Class A preamp, the output circuits are always on for the entire cycle of signal swing or the bias current flows at all times. As a result, Class A preamps have the most linear design, with no crossover distortion, and they deliver purer, clearer, and more musical results than the Class AB designs that are found in many preamps. Compared to a tube preamp, the RC 500’s solid-state preamp offers better definition at the edges of its frequency response range. High frequencies are crisper and low frequencies are tighter, producing a transparent, musical signal that retains the “airiness” of a room and provides a more three-dimensional result than a tube mic preamp can deliver. Clean, fast, reliable FET compression. The RC 500’s FET (Field-Effect Transistor) compressor includes fully variable attack, release, and threshold controls, as well as bypass controls. FET-based compressors such as the one in the RC 500 use transistors to emulate a triode tube’s operation and sound. This type of compressor generally provides a faster attack time and better repeatability than the optical compressors typically found in channel strips. 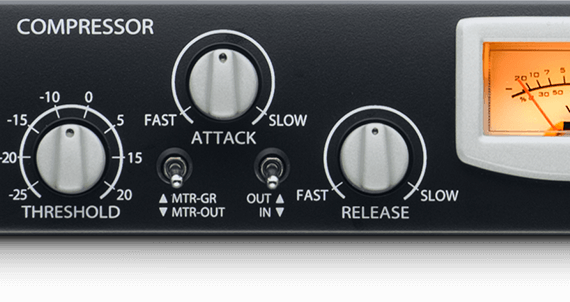 The RC 500 compressor has a “soft knee” compression curve and a fixed 3:1 compression ratio, although the input-gain stage can be driven harder, with a lower threshold, to emulate higher compression ratios. This combination provides lots of flexibility without adding complexity, making dialing in just the right sound quick and easy! Learn more about FET compressors. Broadly speaking, there are four types of analog compressor designs: those that use opto-isolators (optical); Field-Effect Transistors (FETs), as found in the RC 500; voltage-controlled amplifiers (VCAs), as in the PreSonus Studio Channel tube channel strip; and variable-gain compressors. Each has its uses, but we’re going to focus on the two types you’re most likely to find on today’s high-end channel strips: optical and FET. The majority of today’s high-end channel strips utilize optical compressor circuits. In general, the response time of the optical circuits in these compressors tend to soften the attack and release, which can smooth out uneven volume fluctuations. They often have a distinctive sonic signature, so they can be as much an effect as a gain-control device. FET compressors use a special transistor to vary gain, emulating a triode-tube sound. Inherently high-impedance devices, FET compressors tend be very clean and reliable and provide a faster attack time than most optical compressors. However, aside from having a distinctive sound, optical compressors have drawbacks. Most notably, when the components in an optical compressor heat up or cool down, the resulting attack and release times can change considerably. That means you might not get consistent results—even on, say, multiple snare hits in the same song. Unlike optical compressors, FET compressors such as the one in the RC 500 are not susceptible to temperature fluctuations, so they provide consistent, repeatable results. The RC 500’s 3-band semi-parametric EQ was designed to match its preamp and compressor. It combines isolated filters and optimized, per-band Q to provide subtle signal-shaping without harsh artifacts. All three bands have Gain (±16 dB) and Frequency controls and fixed Q (0.5), and the mid and high bands have overlapping frequency ranges. The low and high bands are switchable between shelving and peak. Both the compressor and the EQ can also be hard-bypassed, allowing you to remove either or both from the circuit. A wealth of connections and features. When you have a special processor like the RC 500, you’ll want to use it in a wide range of applications, so we’ve given it flexible I/O and all the features you’re likely to need. Rear-panel XLR mic and line inputs and a front-panel ¼” instrument input accept a variety of sound sources, managed by a handy Input Select switch. You get balanced outputs on XLR and ¼” TRS connectors as well as a balanced send and return for patching in your favorite boutique processor—or use the send to record both the processed and the unprocessed preamp signals at the same time. We also included +48V phantom power, polarity inversion, a 20 dB pad, and a -12 dB/octave highpass filter with a threshold set at 80 Hz. A large, backlit, dual-mode analog VU metering enables monitoring of output and gain-reduction levels. A master level control adjusts the overall output from -80 to +10 dB. It all adds up to a complete, versatile channel strip that will enhance any studio. 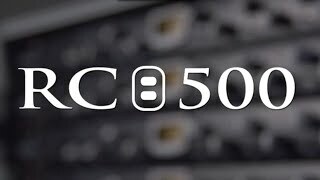 With its features, connectivity, and outstanding sound, the RC 500 is fast becoming a classic channel strip. The way the preamp, compressor, and EQ work together is truly magical; we can describe it but you really should hear it for yourself. Fortunately, you can hear it now at your favorite PreSonus® dealer!